^ a b Riehl, Rüdiger. Editor. ; Baensch, HA (1996). Aquarium Atlas (5th ed.). Germany: Tetra Press. ISBN 3-88244-050-3. ^ Leibel WS (1993) A fishkeepers guide to South American cichlids. ^ Loiselle, Paul V. (1995). The Cichlid Aquarium. Germany: Tetra Press. ISBN 1-56465-146-0. ^ Sands D (1994) A fishkeepers guide to Central American cichlids. ^ Eade, Andrew (1999). 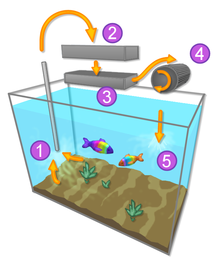 Coldwater Fishkeeping. Ringpress Books. pp. 33. ISBN 1-86054-072-4. ^ Axelrod, Herbert, R. (1996). Exotic Tropical Fishes. T.F.H. Publications.. ISBN 0-87666-543-1. ^ Sanford, Gina (1999). Aquarium Owner's Guide. New York: DK Publishing. pp. 164–167. ISBN 0-7894-4614-6.